The Heard’s popular evening series, Native + You, or NU, is back, during First Fridays, the popular monthly Central Phoenix celebration of the arts! Visitors can enjoy the Heard’s 12 exhibit galleries, nationally-acclaimed Courtyard Café and gourmet drinks at the Coffee Cantina, and see the best in Native art at the Heard Shops. And we’re easily accessible by Valley Metro Light Rail; the Heard has its own stop on Central Avenue directly across the street from the museum! Get on at Roosevelt Street and head north two stops to Encanto Boulevard! 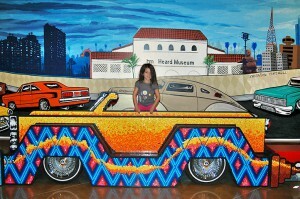 In October, the theme is “Cruise Control at the Heard.” See fabulous lowriders and visit the Heard’s galleries! Enjoy the groovings of DJ Randy Boogie and watch a series of breakdancing performances featuring the likes of Remind (style elements / WOME), Nate the Killa Robot (fresh descendents / XFRX), Vo Vera (rebel antes / sacred G’s), JLeigh (experimental earth movemeant ) and a special dance and spoken word performance by Jade Catron. 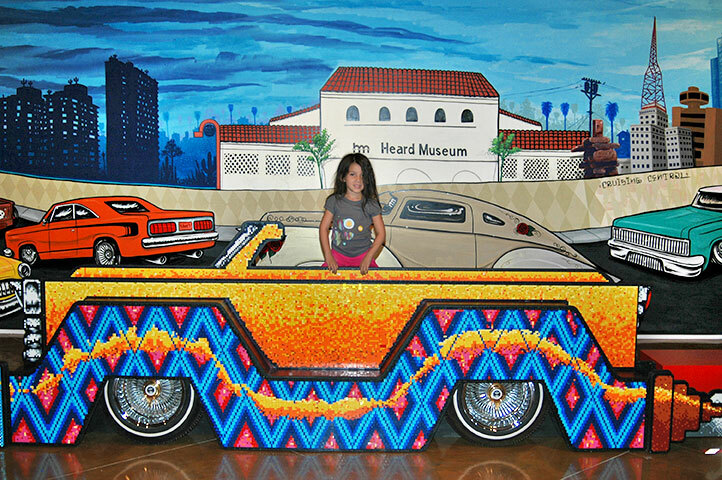 A photo booth featuring Hispanic artist Lalo Cota‘s LEGO brick lowrider car and mural, “Cruising Central,” from the Heard’s popular summer exhibit, BUILD! Toy Brick Art at the Heard, will be available. You will be able to pose “cruising” Central Avenue, as once was the Friday and Saturday night thing to do in central Phoenix. Muddy Monsoon: An “adult chocolate milkshake” with Dorda chocolate liquor, vanilla gelato, coconut milk and chocolate syrup. Oak Creek Caramel Ale Float: Oak Creek Pale Ale, vanilla gelato and caramel syrup. Every first Friday of the month except March, the Heard offers free admission from 6 to 10 p.m., where NU will bring fun and fresh events to the Heard to share the cultural pulse of Phoenix and the Southwest today! DJ Randy Boogie will be behind the microphone at Native + You (NU) on First Friday, Oct. 3 at the Heard Museum.